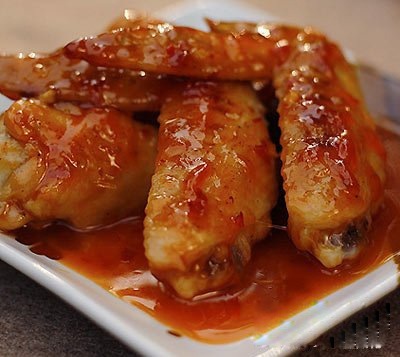 Today introduced a very popular recipe, named Thai sauce chicken wings. Its greatest advantage is not only delicious ,but also extremely simple, do not spend too much time and effort. Seasoning: salt, white pepper, rice wine ,Thai sweet chili sauce. At first: with a toothpick to tie numerous small holes on the wings, add salt, white pepper and rice wine mix well, marinated for 1 hour. And then, pour a little oil into the pot, small fire ,fried the chicken wings until become yellowish on both sides, remove,standby. Lastly, pour appropriate amount of water,add Thai sweet chili sauce ,stir and boil. Add above chicken wings to cook until sauce thickens. The Thai Sauce Chicken Wings is finished.